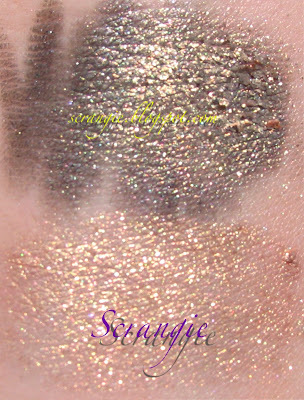 Scrangie: MAC Neo Sci-Fi Polishes and Solar Field Solar Bits, more swatches. MAC Neo Sci-Fi Polishes and Solar Field Solar Bits, more swatches. 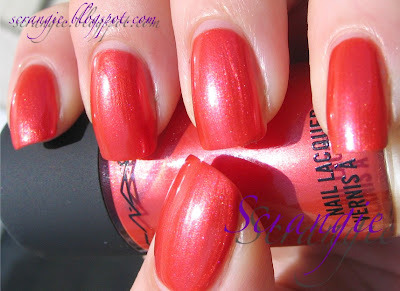 The sun was out today, so I got some better pictures of the MAC Neo Sci-Fi polishes. I also did a little experimenting with the MAC Solar Bits. First, the Solar Bits. I am having a lot of trouble with these. They don't behave like a traditional MAC Pigment. They are flaky, messy and weird. The good news is that they work amazingly well with MAC Water Based Mixing Medium. Black Ore. The first two notches indicate Too Faced Shadow Insurance and Urban Decay Primer potion. There was no difference at all between these, so they are only in this picture. The third section is Black Ore over Sharkskin Shadestick. Once again, not much of a difference, other than the Shadestick causing difficulty in blending. The last section is Black Ore with a little bit of MAC Water Based Mixing Medium. When the mixing medium is added it transforms this product into a smooth, shiny metallic liquid that applies like a dream. 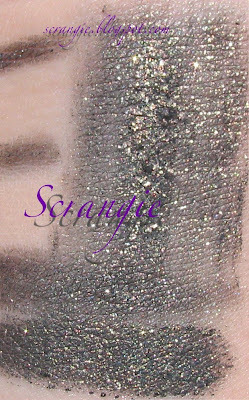 It causes the pigment and shimmer to mix together, creating a uniform and well-behaved product. This is Sunpower. The top is Sunpower over Sharkskin Shadestick. 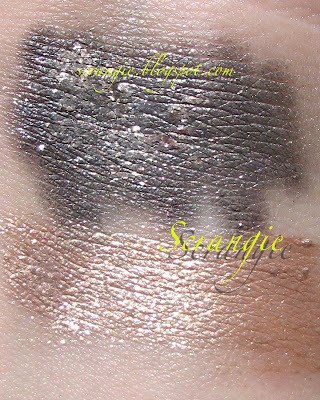 It has the undesirable effect of clumping up into a weird metallic mess when applied over Shadestick. The bottom is Sunpower mixed with a drop of mixing medium. See how smooth, fluid and shiny it is? It becomes a liquid resembling molten metal. Bronzescape, over Sharkskin and with mixing medium. Notice the weird clumping that occurs when applied over the shadestick. Scatterays, over Sharkskin and with mixing medium. I used a little more mixing medium and a little less pigment this time and it creates a sheerer, less dense metallic effect. In conclusion, these can easily be worn without mess and fallout with just a touch of MAC Water Based Mixing Medium or similar product. Here are the Neo Sci-Fi polishes again, this time in bright sunlight. Notice how they look like they're glowing. I think I may get Metalist, but I'm undecided. 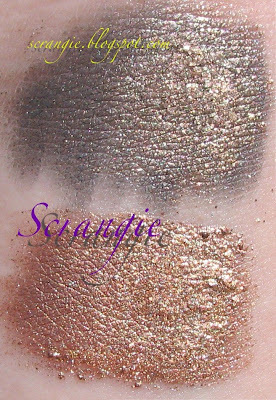 I will have swatches as soon as I make up my mind. Overall, I think these three are some of the best and most unique polishes MAC has released in quite some time. yay! thanks so much for the comparisons with bases and the mixing medium! very helpful...i need some!